This month’s Improv Challenge is to make and blog about a recipe containing vanilla and chocolate. I made the assumption that half the posts would be marble cake (the other half chocolate cake with vanilla extract). 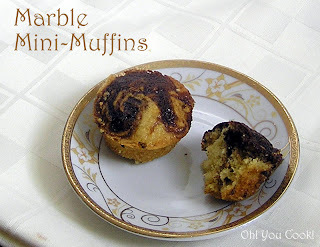 So I decided to be different – marble mini-muffins. Yes, dare to be different … my middle name. I like the occasional (okay, at least once a week) slice of marble pound cake. Besides looking very pretty, *cough* healthy *cough* chocolate swirls through and about buttery-rich vanilla-flavored pound cake. What is my favorite part of this recipe … besides the taste? No electric mixer needed! That’s right! Just a whisk or two, a wooden spoon and a toothpick. Didn’t even bother with a spatula. In an attempt to use all the batter, I very carefully overfilled the cups to the 2/3 mark. Don’t make the same mistake! And try to fill the cups evenly, while you are at it. On the other hand, the spilled-over muffins were easier to remove from the tins. Go figure. 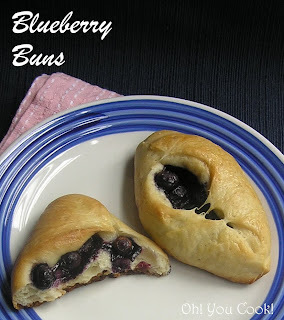 There were these blueberry buns that my American-born mother used to make for my Polish-born father. Blueberries were cradled in a slightly sweet raised dough. Because of their oval shape, my sister and I dubbed them "blueberry footballs." "Way back when" you could only get fruit in season, so we only enjoyed these footballs during around one month each summer when east coast blueberries were at their peak. Nowadays you can get just about any fruit any time of the year. But the best fruit is local, and blueberries are at the height of the season. Which brings me back to "blueberry footballs." Every time this year I try to recreate that elusive taste. The blueberry buns had I posted 3 years ago were made with challah dough. And they were good. But not quite. As an a side, while doing some blueberry bun surfing I found this 2003 term paper-like review about the history of the Toronto Blueberry Bun. Go read it, then come back. I'll wait.